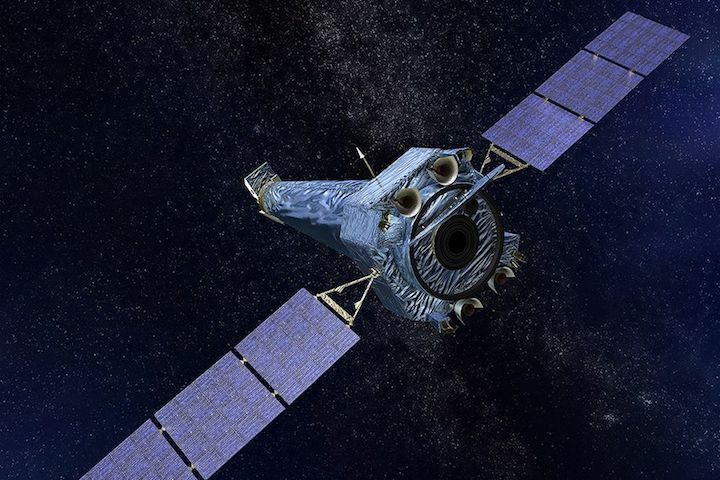 An artistic rendering of the Chandra X-ray Observatory in orbit. After briefly going into safe mode last week, NASA’s Chandra X-ray Observatory — which observes galaxies and nebulas from Earth’s orbit — should be getting back to normal operations soon. The cause of the disruption was a small glitch in one of the spacecraft’s instruments used for steering and pointing. But the space agency has since fixed the problem, and the telescope will be back to observing the Universe by the end of the week. Launched in 1999, Chandra has been in operation for nearly two decades, observing X-ray light coming from the most heated gases in the Universe. Everything from exploding stars to the super heated material churning around a black hole can give off X-rays that Chandra can pick up. The telescope is credited with a number of huge discoveries, such as helping scientists better understand the origin of dark matter, the mysterious unseen material that supposedly makes up nearly a third of our Universe. But on the morning of October 10th, Chandra entered safe mode unexpectedly, a period during which a spacecraft’s instruments are all turned off and only the most fundamental systems are kept on. NASA has now figured out that the safe mode was triggered by a glitch in one of the spacecraft’s gyroscopes, or gyros. These tools are a bit like steering wheels inside the telescope that measure how fast a vehicle is turning. They’re necessary for helping a spacecraft turn and stay pointed at targets for long periods of time. The glitch resulted in the gyro measuring three seconds of “bad data,” which led Chandra’s onboard computer to come up with the wrong value for the vehicle’s momentum, according to NASA. This apparently prompted the safe mode. Now, NASA has decided to use one of Chandra’s other gyros in its place and put the glitchy one on reserve. Meanwhile, NASA is still having issues with its other space telescope, Hubble, which also went into safe mode due to a gyro issue. One of Hubble’s gyros completely failed, and the team has been trying to get a backup gyro up and running to replace it. They haven’t been successful yet, but they are working hard on the backup gyro. Ultimately, Hubble can still work without the replacement, but it will be limited in what it can observe.